Since most birds shed and regrow feathers year to year, it is helpful to know how to make them. Both feathers and hair are made with the same thing: a protein called keratin. To make a hair, you more or less start by just stacking one protein on top of another. It all happens in a follicle embedded in the skin. 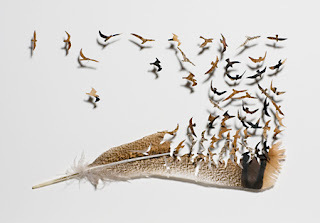 To make a feather, the process is more complex. “Imagine people in a crowded sports arena doing “the wave.” As it passes, each individual stands up and raises his or her hands at precisely the right moment to keep the wave moving fluidly around the stadium. Cells at the follicle collar behave the same way, but instead of standing and waving, they add keratin to the growing feather barb. Route a small blood vessel to each follicle to supply the nourishment to each feather as it grows. Make sure you cut off the supply when the feather achieves full growth or else the bird could bleed to death if a large feather is pulled out. Once the feather is grown and blood supply is cut off, the feather is fully functional. If it should get pulled out, just start the process of making a new feather all over again, immediately. If the feather merely breaks but the shaft remains in the skin, you will have to wait until the year’s next feather pushes the shaft out. When you get really good at making feathers, please tell me how you get the same pattern and color in each feather every time they shed. And how do you get the same matching feathers on each side of the bird? No matter how much I read about feather growth, it still seems like a wonderful mystery.